It's dinnertime, and you're craving something with a little flavor. Maybe you'll grab Indian takeout or whip up a taco salad. But, uh-oh, these days it's easy to find yourself biting into the ethnic version of a triple burger and fries. "We've Americanized dishes to the extent that they don't have their original health benefits," says Daphne Miller, M.D., author of "The Jungle Effect: The Healthiest Diets from Around the World -- Why They Work and How to Make Them Work for You." Enjoy global cuisines in their purest state, on the other hand, and you get meals that are light, nutritious, and incredibly yummy. So we asked experts to rank the 10 healthiest cuisines and reveal what makes them good for you. There's a good reason docs love the Mediterranean diet: Traditional Greek foods like dark leafy veggies, fresh fruit, high-fiber beans, lentils, grains, olive oil, and omega-3-rich fish deliver lots of immune-boosting and cancer-fighting ingredients that cut your risks of heart disease, diabetes, and other diet-related ailments. In fact, eating a traditional Mediterranean-style diet is associated with a 25 percent reduced risk of death from heart disease and cancer, according to Harvard University research. And people lose more weight and feel more satisfied on this type of diet, which is rich in healthy fats, than on a traditional low-fat diet, another Harvard study suggests. This cuisine also ranks high because of how it's eaten, says Miller, who is also an associate professor of family medicine at the University of California, San Francisco. 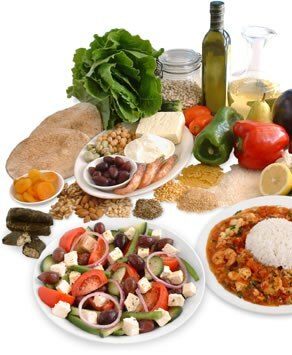 "The Greeks often share small plates of food called meze," she says, having just a bite of meat along with low-cal, healthy Greek staples like fresh seafood, slowly digested carbs (beans, eggplant, or whole-grain breads), and small portions of olives and nuts. If you're eating out, order grilled fish and spinach or other greens sautéed with olive oil and garlic. "This dish gives you the anti-inflammatory combo of olive oil and greens with the blood-pressure-lowering effects of garlic," Miller says. Danger zone: Unless you make it yourself and go light on the butter, the classic spinach pie (spanakopita) can be as calorie- and fat-laden as a bacon cheeseburger.